Royal British Legion members met for a caseworkers seminar in Chiang Mai. When the Royal British Legion first formed in 2007 we had no idea of the amount of welfare work we would become involved in, we were aware of course that our primary aim was the care and welfare of those who have served/are serving and their dependents however we had no idea of the amount of ex-service people who have either retired here or visit on holiday. Our initial welfare team consisted of two, myself (Bert Elson) covering Central and South Thailand and Glenn Croston who covered North Thailand. 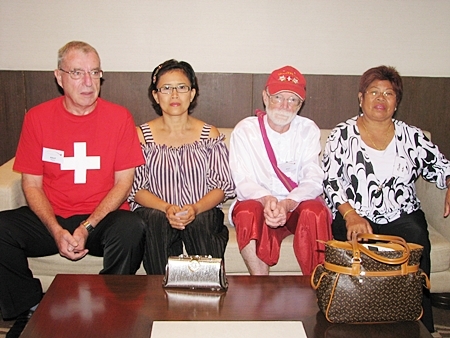 Both were soon in action as untrained caseworkers and it soon became obvious that A/ we needed training and B/ we needed more welfare caseworkers, it was not uncommon for us to travel 12 to 15 hours ONE WAY to visit a case and then return home to either Pattaya or Chiang Mai. Glenn was the first to complete a caseworkers course in the UK and I completed mine along with a trainers course in 2011, this not only gave Glenn and myself the confidence to carry out our welfare work but also enabled me to train the caseworkers we desperately needed to cover Thailand. Our first Basic Caseworkers course was soon held giving our branch seven more caseworkers and allowing us to cover Bangkok, Central Thailand and some of the popular holiday islands (Phuket and Koh Samui). 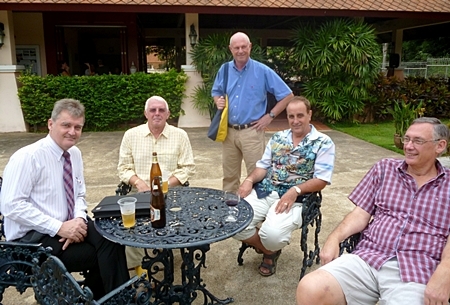 Chiang Mai’s Royal British Legion members at the start of the seminar. Our work has revolved mainly around either elderly veterans who have retired here or some of the many younger ones (some still serving) who visit the many holiday destinations here in Thailand, we also have a number of widows under our wing who we ensure receive any entitlements they are due. Some of our cases unfortunately fall outside of our guidelines, for instance Private Medical Care so please whilst Thailand is a wonderful place to visit or retire please remember that healthcare is your responsibility. It was obvious on our very first welfare case that we may have a language problem, if dealing with someone in one of the many private hospitals we normally had an international representative to deal with. When dealing with Government hospitals where many of our clients are we had no such luxury, my wife soon became my and other caseworkers constant companion. Our need for Thai involvement became even more apparent with the case of Sing Ram Tang who, as a Karen lived in the hills bordering Thailand and Burma, Sing was also a member of the North Kachin Levies (Late 3rd Burma Rifles) who fought alongside the British in WWII and was awarded the Burma Gallantry Medal. Thanks to the many volunteer groups who work amongst the Karen Tribes our Northern caseworker Glenn was informed that Sing was unwell, Glenn was soon on the job and although poor Sing passed away with the help of Susan and her head office team we soon Almonised and provided help for Sing’s dependents. 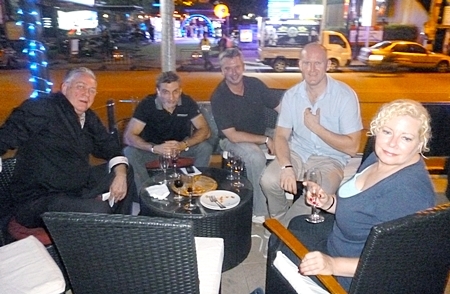 Graham MacDonald, Bert Elson and Derek Brook flew up from Pattaya for the seminar and drinks afterwards. Our latest caseworkers course was held a few days ago in Chiang Mai and I am glad to report that on the course was our first Thai candidate Jaa, Jaa is a trained nurse and has been a member of the Legion for some time. She and the other candidates passed with flying colours giving Thailand a total of 14 trained caseworkers. We also had a guest on the Chiang Mai course a Mrs. Nancy Lindley from Lanna Care, a local charity who assists ex Pats of many nations who find themselves in distress. My visit to Chiang Mai was also to attend their Branch Meeting and for this I was also accompanied by Branch President Graham Macdonald and Branch Chairman Derek Brook, we received a fantastic reception before, during and after the meeting and have made a pledge to go more often. The Chiang Mai Branch are at present looking for a new home to meet in so please watch this space for future announcements. We hope to hold two more basic caseworker courses soon, one in Pattaya (with my wife as first candidate!) our busiest area and one in Phuket that would also cover the South of Thailand, anyone wishing to join the Legion or who have served in the UK Armed Forces and need assistance please contact: Pattaya-Bert Elson, [email protected] or call in to Tropical Bert’s on the junction of Soi 6/1 and 2nd Road. In Chiang Mai – Tony Archer, [email protected]. Royal British Legion members are actively involved in aiding servicemen and women in Thailand. 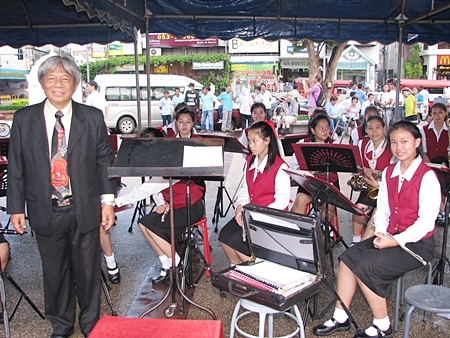 Chiang Mai Governor M.L. 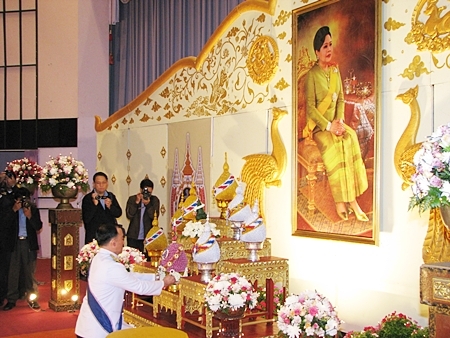 Panadda Diskul pays his respects to HM Queen Sirikit by placing offerings of flowers at her portrait at the ceremony at CMU Convention Center on August 12, 2012. Chiang Mai saw celebrations in honor of HM the Queen’s 80th birthday from early morning through the evening, with the day beginning early for many with alms giving ceremonies in honor of HM the Queen starting at 6 a.m. 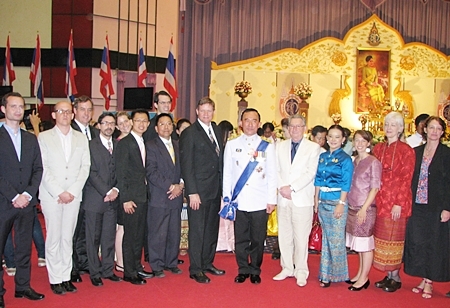 The Provincial government then held ceremonies attended by government officials, elected officials, Royal Thai Army and Air Force officers, Consuls and Honorary Consuls, business leaders, academic leaders, members of the Lanna Royal families, disabled citizens who have been aided by Royal projects, students, and many others at the Chiang Mai University Convention Center where a merit making ceremony was held and led by the Abbots of the leading temples in Chiang Mai. The day was filled with Mother’s Day celebrations around town including at Tha Pae Gate, Central Airport Plaza and Kad Suan Kaew and ended up with a candle lighting ceremony at Tha Pae Gate led by Chiang Mai Member of Parliament Tassanee Buranupakorn. 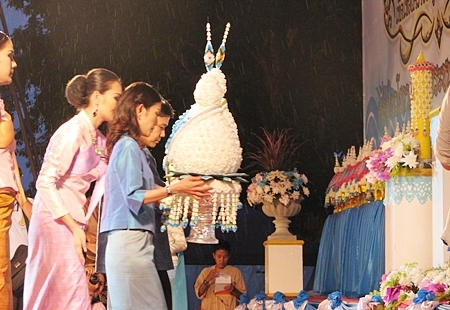 Everyone dressed in HM Queen Sirkit’s color of light blue for the evening and joined together in song praising HM the Queen and her works. The square was filled with weavers and other craftsman demonstrating the many skills that HM the Queen has helped to promote through the SUPPORT Foundation. Chiang Mai’s Member of Parliament Tassanee Buranupakorn and Mayor of Chiang Mai Tussanai Buranupakorn take part in the merit making ceremony offering flowers to the portrait of HM the Queen on Sunday, August 12. The rain didn’t slow down the evening. The student band from Jara Witthalayu School entertained the crowd at Tha Pae Gate at the evening celebrations. The team from Helping Hand English language program at Radio Thailand NBT Chiang Mai joins Chiang Mai Governor M.L. Panadda Diskul at the ceremonies at CMU Convention. 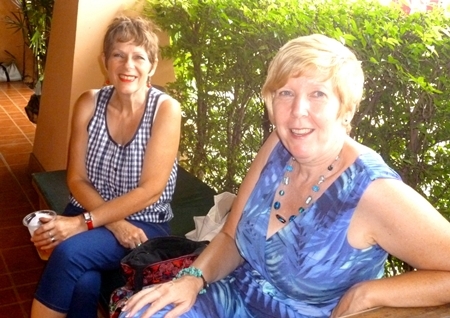 Gill Dobson is joined by her friend Pam at the door checking tickets for the event. The Royal British Legion held their annual Summer Splash at the Pool at the Centre of the Universe and raised just under 15,000 Baht for the Royal British Legion. The Royal British Legion has been helping veterans since 1921, providing aid and care with recover centers for injured personnel; support for bereaved families, financial help and retraining for veterans as well as providing support for their families. The RBL will also be holding a Charity Golf Fundraiser in conjunction with the Golfaholics Club to raise funds to aid Thai veterans as well. Additionally, they hold Remembrance Day ceremonies at the Foreign Cemetery every year on November 11 at 11 a.m. Everyone is welcome to attend. Sally Ward supervised the bar while Lamorna Cheesman and John Morgan enjoyed a glass of wine. 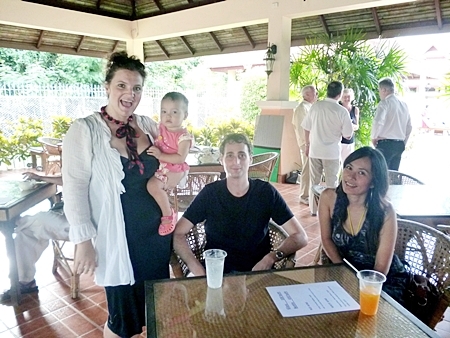 Ana Gracey and her lovely daughter join Rhys Bonney and Amy of Assist Thai Visa at the party. Richard Prouse and Rex Baggaley are joined by friends at the Summer splash catered by The Dukes Restaurant at the Centre of the Universe. 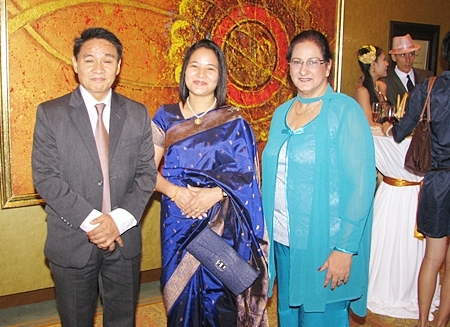 Dr. Chao Duangduen na Chiengmai, the President of Chiang Mai Provincial Cultural Council graciously presided over the installation night and celebration. 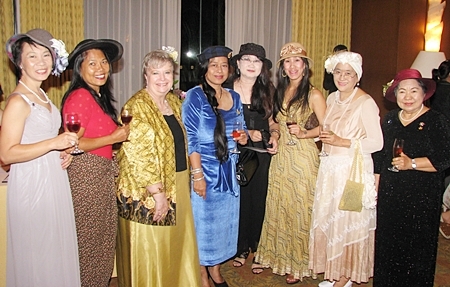 Women’s international organization Zonta installed their new President, Raya Luelai on August 9, 2012 at the Shangri La Hotel at their annual fundraising ball that saw the ladies of Chiang Mai dressed to the nines wearing a multitude of hats! 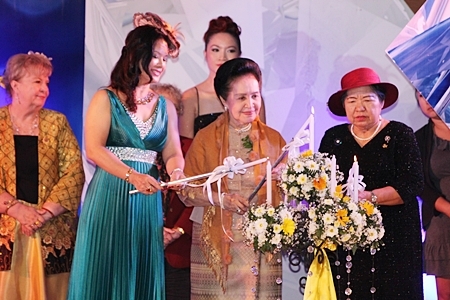 Raya replaced outgoing President Jiamjit Boonsom to take the helm of Zonta. Zonta International was founded in the USA in 1919 and now has chapters in 66 countries. The name comes from the Native American tribe the Lakota Sioux word for “ray of light”. Zonta works to support the cause of women worldwide through advocacy and service. In Chiang Mai Zonta has been active in many women’s causes from helping disadvantaged women attend college, aiding the Wildflower Home for abused women, as well as helping AIDS affected orphans go to school by purchasing uniforms and books. The Indian Consul Dhirendra Singh Garbyal and his wife are joined by Vanita Sethi of Fashion King as honored guests to the evening. 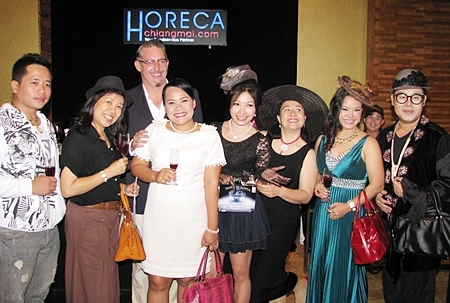 Horeca was one of the leading sponsors of the event, providing mixed drinks for the cocktail hour. 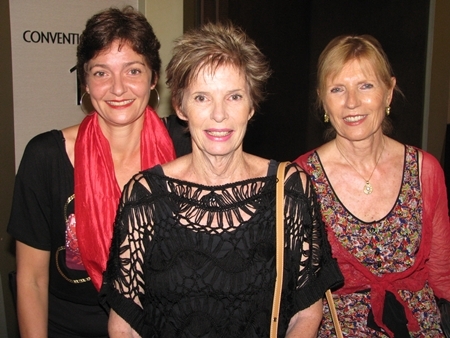 The Zonta Ladies joined for a group photo at the start of the evening. he is joined here by Chetiya, Max and Malee. Max had this vest specially made for the dinner. The crowd ranged from young families to older retired couples and everything in between, many dressed in t-shirts and hats with the famous white cross on a red background that is the Swiss national flag. Eveline said the Swiss Lanna Society has around 140 members and signed up quite a few more at the evening. The first annual national day celebrations, the Society will also put on a Christmas party in December (the date to be determined in the future) as well as the Annual General Meeting which takes place in April. Additionally they offer ‘Treff’; irregular meetings with talks and seminars as well as the weekly ‘Schtum’ held every Wednesday at 6:30 p.m. at the Why Not Restaurant on Nimmanhaemin Soi 13. Additionally members are encouraged to share their expertise and interests in various activities such as a cheese making course. They also meet regularly for tennis, golf and biking. 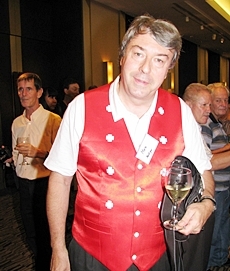 Interested Swiss citizens can contact the Swiss Lanna Society: http://www.swiss-lanna-society.com/index.html. Marcel and Sunisa made sure their sons Narita and Bivio were dressed for the occasion. Monika, Penelope and Hanna were ready to join the festivities. 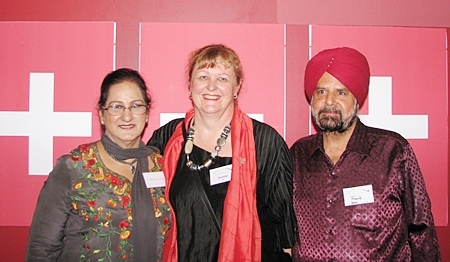 Frank and Vanita Sethi of Fashion King were one of the sponsors for the dinner, here they join Eveline Willi, Events Manager for the Swiss Lanna Society. 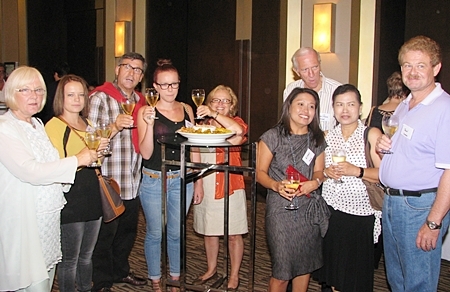 Members and non-members gathered together to chat before the dinner that was held at Le Meridien on August 1, 2012. Mohamad Jesr and Manfred Ilg enjoyed the evening. Sahara Restaurant on Nimmanhaemin is more well known for their tasty Middle Eastern fare than for parties but they threw a fancy dress party in conjunction with Wine Direct on August 9, 2012 that saw many guests drop in for a glass of wine, some delicious food, a belly dancing show from some pretty convincing ladyboys, as well as a fashion show. Although many guests did not take part in dressing up for the party, enough did that awards were handed out for best male and female costume. There was also a fortune teller as well as free flow wine and food. The evening was a great success for both Wine Direct and Sahara which, while struggling to keep up with larger than expected demand, still managed to refill the dishes of chicken, hummus and more. Shari Brown posed with the handsome young men dressed in costume. The belly dancing show featured some pretty convincing ladyboys. 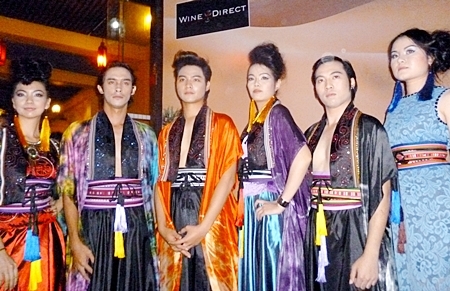 A fashion show closed out the night at Sahara.